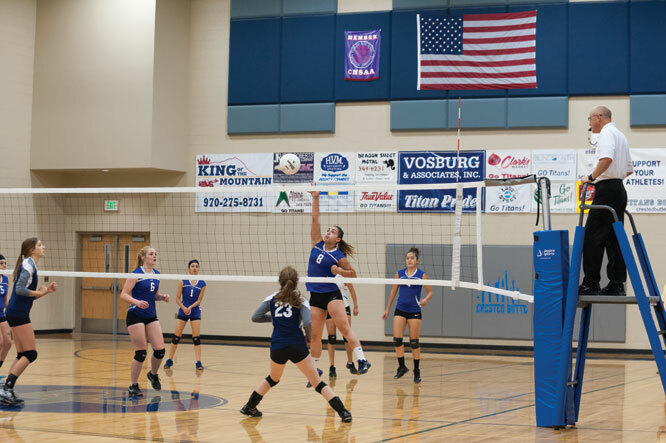 Hopes were high for the Titans volleyball team as they took to the court on Saturday, September 26 to host Center and Cripple Creek for Homecoming. Center is notoriously tough but coach Marla Covey felt confident that if her girls played their game and remained focused, they could take the win. Unfortunately, the Titans imploded instead, falling to the Center Vikings in straight sets to open the day. The Titans opened the first set of the match noticeably sluggish, falling behind 6-2. They managed to climb back into the set to tie it up 7-7, thriving more off of Center mistakes than their own play. The two teams traded off points and the Titans appeared to find their rhythm as Isabel Young rattled off two big kills, but service woes spelled their demise as the set wore on and they dropped the first set 25-19. The Titans came out in the second set a little better prepared and when Avery Pulley dropped a tip over the net, the Titans looked to be back on track. But again, their serves were erratic at best and while they managed to stay in the set, the Vikings dropped the final blow, surging in the end to win the second set 25-20. While the Titans showed heart a couple of weeks ago to come back from an 0-2 deficit to win, no such magic was there on Saturday and the Titans dropped the final set to fall to Center. The Titans got a break to recover and then returned to the court to face the Cripple Creek Pioneers. 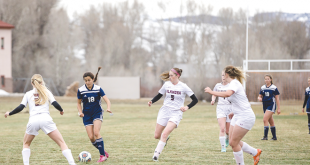 The Titans handled the Pioneers relatively easily when the two teams met earlier in the season and the coaches were hoping for the same on Saturday. The Titans came out strong in the first set, building a 12-5 lead paced by kills from Young and Annie Duryea and a stronger effort at the service line. Cripple Creek called a timeout to try to cool the Titans off but Crested Butte continued to surge, capping the opening set 25-12 win with an ace from Corrina Donovan and a tip from Rowan Pannier. The Titans continued their effort in the second set, taking an early 10-3 lead before another Cripple Creek timeout. The Pioneers started a comeback following the timeout but the Titans capped a rally with a kill by Duryea to take back the momentum. Madison Mollison came up with a big tip and Pulley served the final five points to seal the Titans’ second set win. Crested Butte returned to their woeful ways to open the third set, falling behind 12-6 before Covey called a timeout to reel her team back into focus. A service run from Emilya Ramsey brought the Titans back to within two points and a quick burst tied the set back up at 15-15. Despite continued service issues, team play carried the Titans through the final stretch of the third set to win the set 25-21 and to win the match. 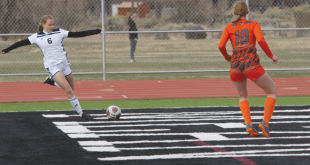 “They turned it around and played more as a team in the second match,” says Covey. The Titans play their next four matches on the road before returning to Mt. Olympus to host Del Norte and Sargent on Saturday, October 17.